The above info came from Elwin Blaine Coldiron, and was edited by yours truly (contact me). The image came from Amazon.com. 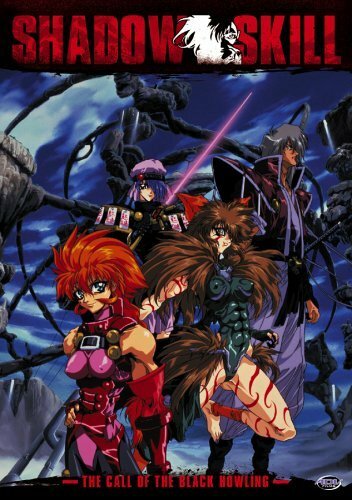 This television version of Shadow Skill is not a sequel to the three previous OVA releases, but rather retells the story of Elle Ragu from Megumu Okada's manga series. Elle Ragu is the 59th and newest Sevalle in the kingdom of Kuruda, a land known for its valiant fighters. Yet for Elle, the title is just a big bore. For one thing, the honor doesn't exactly pay off her massive debts from her excess drinking binges, nor the property damages she builds but in battles. If it weren't for Gau Ban, her adopted brother, and Folli Maya, the Sui Rame talisman sorceress, she possibly would've been thrown in jail by now. But fighters like her are a rare commodity. And now, when new enemies threatening Kuruda's borders, they are going to need her and Gau's destructive talents. Let's just hope they pay well, so that Elle can get out of debt quick!